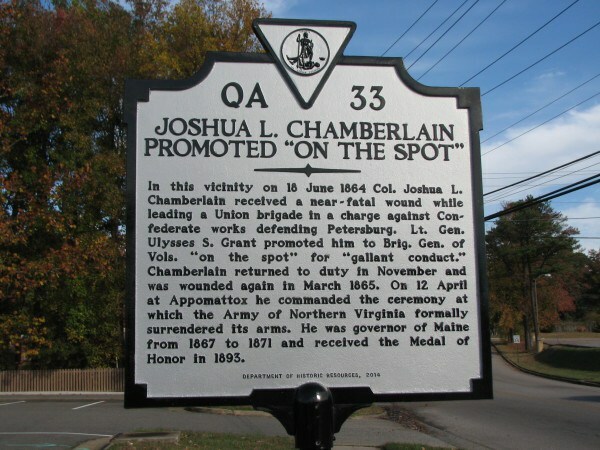 Virginia recently placed a marker to Joshua Lawrence Chamberlain to mark the spot where he was wounded and then later promoted to brigadier general because it was thought he was so grievously wounded he couldn’t survive. Now comes word the State will move the marker. Dennis Rasbach, a surgeon from Michigan, was researching an ancestor and felt he had evidence the marker was in the wrong location. Researcher and author Bryce Suderow supports Dr. Rasbach’s position. Dr. Rasbach petitioned the State to move the marker approximately 4,000 feet. The state Department of Historic Resources brought in two outside experts, Julia Steele, the cultural resource manager at Petersburg National Battlefield, and A. Wilson Greene, the director of Pamplin Park. Steele conducted her own research and agreed with the proposal to move the marker. Greene was fine with the move. In addition, other experts from the National Park Service agreed with the move. Bryce Suderow wrote an Op-Ed piece in which he laid out his objections to the original marker placement. In it he claimed the two primary people behind the original marker placement, Diane Monroe Smith, an author from Maine, and Susan Natale, a historical researcher in California who’s done extensive primary source research on Chamberlain’s life and who owns and operates the Joshua Lawrence Chamberlain website, relied solely on Chamberlain’s recollections and didn’t use any confederate sources. Full disclosure: Susan and I are internet friends. In response to Suderow’s claim, Susan highlighted this section of her website, which is a confederate source in which Joseph Kershaw confirms he was attacked at Rive’s Salient, and this appears to corroborate Chamberlain’s recollection. Ms. Smith wrote her own Op-Ed piece giving her side of the controversy. Unfortunately for those of us who are not privy to the reports and research that prompted the move, the newspaper accounts and Op-Ed pieces don’t lay out the evidence in a cogent manner we can evaluate. We don’t know exactly what Rasbach and Suderow found, we don’t know exactly what Steele found. We don’t know exactly what the other experts said. We don’t know Smith’s and Natale’s full response to Rasbach and Suderow. We can be forgiven for thinking this is only a meaningless, ego-based argument due to the lack of substantive information about the research. I think there’s more to it than that, but only because it’s a feeling I have. As a general rule, I’m very much in favor if this sort of effort. If we’re going to have markers at all, they should be as correct as they reasonably can be, both in content and in placement. We have similar markers all over Texas have proved to be inaccurate and misleading — if not worse. That said, the apparent lack of transparency in this case, and the withholding of the evidence on which the move is based, is not only a huge problem, but actively undermine what they’re trying to do my opting for a more accurate placement. I agree, Andy, though I hesitate to say information has been withheld. It could be that the space limits of newspaper columns dictates that much information is left out, but that information could be available elsewhere. You could try using the state equivalent of FOIA, although it’s a pity that such an adversarial tool is required. I’ve sent an email asking a question, but the person is out of the office for a little while. In Texas, the Texas Historical Commission does make their marker files available to the public, although I think a reproduction fee is required. The files contain the original material submitted to establish the marker — which is decades past was pretty flimsy — as well as sometime subsequent correspondence challenging or correcting the marker content. It helps sometimes to know the sausage-making process that went on behind the scenes. Virginia’s probably the same. Someone could no doubt either visit and have the files copied or request by mail and pay the copy fee. Al, I appreciate that you give Dennis and Bryce the benefit of the doubt. I can’t claim to be unbiased, as I am Dennis’s elder son, and I can’t speak to/for any of the other actors in this debate (on either side). I can assure you that as far as my father goes, he has been deeply engaged in research concerning his and my mother’s ancestors for at least 15 years. He has devoted countless thousands of hours to tracing his roots and uncovering their stories. While he is not a historian (ironically, I was the only one in my family who did not go into medical fields; I majored in history and teach but remain unpublished), he has a brilliantly analytical mind and is scientifically curious, meticulously observant, and scrupulously honest. I assure you his motives in getting to the bottom of the blatant inconsistencies between Chamberlain’s later recollections on one hand and the contemporary accounts of fellow officers and soldiers and the incontrovertible realities of geography had nothing to do with his ego or any kind of internecine debate among Civil War authors and historians. I am not plugging my father’s book, but the full scope of his research and conclusions, as well as the work of the historians who assisted him in his efforts, are coming out sometime next spring (http://www.amazon.com/Joshua-Lawrence-Chamberlain-Petersburg-Campaign/dp/1611213061/ref=cm_sw_em_r_dptod_5aMrwb1BAHYE8_lm). I have little doubt that, as you mentioned, a letter to the applicable authorities or (if that failed) a FOIA request would yield access to the government’s thinking and the relevant research by my dad and others in their considered change of mind. Thank you for the comment, Jonathan. I’ve received copies of the inputs from the Virginia Department of Historical Resources, as well as more information from Susan, but I haven’t had an opportunity to go through everything yet. Once I’ve been able to go through everything I’ll put up another post. 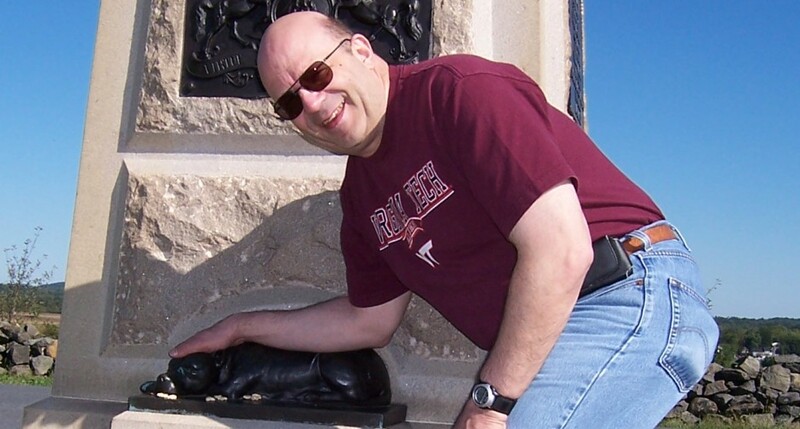 Al, I came across your website today, and was surprised to see the post by my son Jonathan. There is no need to use the freedom of information act to learn about the marker controversy. I’ll tell you anything you want to know. Thanks for the comment, Dennis. As I responded to Jonathan, I’ve received the inputs from the Virginia Department of Historical Resources but haven’t had a chance to go over them yet. Once I do, I’ll make another post and if I have any questions while crafting that post I’ll let you know. The object of my posting to you is to show you that contemporary accounts by both Union and Confederate soldiers reveal that between 3:30 and 4 p.m. on June 18, 1864, Col. Joshua Chamberlain and his 1st brigade of infantry (Griffin’s 2nd Division V Corps) attacked the earthworks defended by Elliott’s South Carolina Brigade. The attack occurred a short distance south of the Baxter Road. I will also point out that Sweitzer’s 2nd Brigade of Griffin’s 2nd DIvision was formed on Chamberlain’s right and was located north of the Baxter road. Also I will demonstrate that Hofmann’s 2nd Brigade of Cutler’s 4th Division was located on Chamberlain’s left, with a second brigade, Bragg’s 1st Brigade. behind and in support of Hofmann. We will begin by examining the Union accounts of June 18th. We can establish the location of Sweitzer’s 2nd Brigade from two sources, from the official report of Colonel Tilton who commanded the 22nd Mass. Inf. regiment of Sweitzer’s Brigade and a letter to Chamberlain from Brig. Gen. Oliver Knowles, 21st PA Cavalry in the Chamberlain papers at the Library of Congress. The 21st Pennsylvania Cavalry was part of Sweitzer’s Brigade. In his official report, Tilton says Chamberlain advanced into a ravine to the left of Col. Sweitzer, who was north of the Baxter Road. When Tilton took command of of the seriously wounded Chamberlain’s brigade on the evening of June 18, it was still in this same position relative to Sweitzer (Tilton’s report OR Vol. 40, Part 1, pp. 456-457). Knowles explains to Chamberlain that his regiment was the one furthest to the left in Sweitzer’s brigade, north of the Baxter Road. Knowles noted in an 1865 letter to Chamberlain that his regiment’s left flank connected with Chamberlain’s right after the two brigades crossed the Norfolk Railroad on June 18 (Letter of Dec. 15, 1865 Chamberlain Papers, Library of Congress). These two accounts make it clear that Sweitzer’s Brigade was north of the Baxter road and Chamberlain was on his left to the south of the road. We can establish the location of Col. Hofmann’s 2nd Brigade of Cutler’s 4th Division from three sources. First, there is a statement from Tilton in his official report. Second, there is a communication from Cutler to one of Warren’s staff members revealing Chamberlain’s presence on the same hill he occupied. Third, Cutler’s official report places Hoffman’s Brigade in Cutler’s front line and Bragg’s Brigade in a second battle line. Tilton says that after he took command of Chamberlain’s Brigade at dusk, he contacted the brigade commanders on his left and right. He writes, “Colonel Hofmann on the left, commanding a brigade in Cutler’s division, assured me of his cooperation at the right moment.” Tilton’s report OR Vol. 40, Part 1, p. 457). In a communication of 1:30 p.m. Gen. Cutler informed Warren that he had advanced to a crest located 600 yards from the Confederate line with a plateau in front of him. Chamberlain’s brigade was with him on the crest. Cutler wrote to Lt. Col. Frederick T. Locke, Warren’s adjutant general, “My first line is on the crest about 600 yards in front of the enemy’s works, a plateau in front of me. Col. Chamberlain understands that he was to take the crest where I am.” (Cutler to Locke 1:30 p.m. June 18, 1864 OR Vol. 40, Part 2, p. 187). Cutler’s official report makes clear that Hofmann’s brigade formed Cutler’s front line of battle and was supported by Bragg’s brigade which formed a second battle line. This means that Hoffman was on Chamberlain’s left. Cutler wrote “. . . at 3:20 p.m. moved forward, my second brigade, (Colonel Hofmann) leading, supported by my First Brigade (Colonel Bragg).” (Cutler’s report in OR Vol. 40, Part 1, p. 374). These three accounts make it clear that Hofmann’s 2nd Brigade was positioned on Chamberlain’s left. To sum it up, Union sources help us pinpoint Chamberlain’s attack and the attacks made by the brigades on his left and right flank. What do the Confederate sources say about attacks on their front? According to Chamberlain he attacked Rives’ Salient which was held by Charles Field’s division of the Confederate I Corps. Field’s division consisted of five brigades, the Texas Brigade, G.T. Anderson’s Georgia Brigade, Benning’s Georgia Brigade, Bratton’s South Carolina Brigade, and Oates’ Alabama Brigade. We emailed the authors who had written books or manuscripts on four of the five brigades and asked them if their particular brigade was engaged on June 18, 1864, These authors were John Schmutz (Texas Brigade) Henry Person (Anderson’s Brigade), Andy Johnson (Benning'[s Brigade) and Gary Laine (Law’s Alabama Brigade). They all said there was no attack on their brigade on that date. Bratton’s report is in the Official Records. He wrote, “On the next morning (18th) we were relieved by troops of Pickett’s division and moved across the Appomattox to Petersburg, and were put into position on the line about Battery 34. At dark we moved to the left and relieved troops on the new line covering the Baxter road, my left resting on the battery under which the enemy afterwards sprang a mine.” (Bratton’s report OR Vol. 40, Part 1, p. 766. Note that he does not mention an attack against his front. To sum it up we have asked five researchers whether they think their brigade that they are studying in Field’s division was attacked on June 18th. All 5 say the same thing: their historical sources mention no attack and that they think there was no attack. Finally, there is Charles Field’s account for the division and he mentions no account either. Clearly, Chamberlain is mistaken when he claims he attacked the front held by Field’s division. Is it possible that he attacked further north, as Wilson Greene claims? This would place him attacking Kershaw’s Division, located on Field’s left. The division’s left flank brigade was Kershaw’s old brigade of South Carolinians, commanded by Henegan. On Henegan’s right was a brigade of Mississippians led by Gen. Benjamin G. Humphreys. If there were an attack, it would be mentioned in the diary of Col. William Dayton Rutherford, who commanded the 3rd South Carolina Infantry, located on the left of Kershaws South Carolina Brigade. He wrote in his diary, “Arrived at Petersburg early in the morning. Our pickets driven in. Enemy massed in our front but does not attack.” (Entry of June 18, 1864, William Dayton Rutherford Diary, Caroliniana Room, Caroliniana Library, Columbia, South Carolina). Humphreys writes, “We were soon busy constructing breastworks, but the enemy ‘s advance made us lay down our spades. The enemy halted at the railroad and concealed themselves. Other columns continued to advance as Grant extended his entrenchments to our right the Confederate forces still arriving and confronting him.” (Benjamin G. Humphreys “The Sunflower Guards” page 26, in Claiborn Papers, Southern Historical Collection, University of North Carolina, Chapel Hill). At about 4 p.m. enemy’s skirmishers advanced on road, (one Napoleon wheel broke off, one limber wheel disabled, one Parrott gun carriage disabled) of Taylor’s Creek, and drove in our skirmishers to their work. The enemy made a charge in two lines of about one brigade near Elliott’s right artillery. Our artillery and the 18th and 26th South Carolina regiments promptly repulsed them, except about 300 who sought shelter in the ravine on that part of our front. General Elliott sent out two companies and drove them off. A raking fire of one of Slaten’s guns, followed by the fire of two companies moved forward from our lines by Brigadier General Elliott promptly drove them from their cover Report of Major General Bushrod R. Johnson, C. S. Army, commanding Johnson’s Division, of operations June 16-18, 1864, beyondthecrater website. It was this letter to Jennifer Loux and letters from Wilson Greens of Pamplin Battlefield Park, David Lowe of the NPS, Julia Steele and Jimmy Blankenship of the NPS, and Philip Shiman of the DOD that persuaded Jennifer Louix to move the marker. Although Diane Smith claimed she’s already seen and dismissed the evidence listed above, this is not the case. The four men who have written about brigades in Field’s Division never heard from her. The fact is she believed what Chamberlain said and stopped doing her research on the location of his attack at that point. Thank you for taking the time to compose such a detailed response, Bryce. I appreciate the effort you went to in order to do so. If you don’t mind, let me suggest that your last sentence should read your impression is Ms. Smith believed what Chamberlain said. I would hesitate to say she stopped doing her research at that point. You might want to check with the loc on that Knowles quote, as they seem to be under the impression no such letter exists. Maybe also try actual quotes and not altered paraphrases. Bvt. Brig. Gen. O. B. Knowles [Col. & CO, 21st PA Cavalry] to Chamberlain, Dec. 15, 1865, Library of Congress, Joshua Lawrence Chamberlain Papers, box 4, folder : Reminiscences to Chamberlain. Thanks, Dennis. I think we can all unite in the quest to understand. This is a comment on Susan Natale’s claim that Kershaw himself said he attacked at Rives Salient. First, the source is by an officer of Kershaw’s brigade, Augustus Dickert, not Kershaw himself. Second, Dickert says nothing about the division being at Rives Salient. Third, Kershaw’s Division was not at Rives Salient at the time Chamberlain attacked. Charles Field’s division was there and Kershaw was north of Field (on Field’s left flank) and on Kershaw’s left flank was Bushrod Johnson’s Division which extended south of the Baxter Road where Chamberlains brigade attacked. As will be seen in my previous posting. This isn’t rocket science. Confederate sources in both Kershaw’s and Field’s Divisions say there was no attack on their front. Actually, that was poor wording on my part. Susan merely says it’s a confederate perspective. I should have been more careful in my wording and not said it was Kershaw himself. I apologize for the confusion on that. Al probably got confused with something I showed him privately. It’s all good. Arrived at Petersburg early in the morning. Our pickets driven in. The enemy masses in our front but does not attack. Our division was greatly exhausted but were cheered by the South Carolinians and Georgians as “fresh troops.” We were soon busy constructing breast works, but the enemy “advance” made us lay down our spades. The enemy halted at the railroad and concealed themselves. Rives’ Salient refers to the area around batteries 25-27, which is to the left of the Jerusalem Plank Road. That is precisely where Kershaw ended up. Without getting in to lengthy details, may I summarize all this to see if I understand it? Chamberlain claimed he attacked Rives’ Salient. The troops posted there report no attack. (I *think* this is remarked upon somewhere in a footnote as perhaps indicating how easily the attack was defeated.) Troops further north report being attacked, with reported details that are consistent with Chamberlain’s attack. Reports from other Union officers indicate Chamberlain was farther north, thus attacking elsewhere. The “traditional” position of the attack appears to be based largely on Chamberlain’s recollections. That’s it, in a nutshell. Well-spoken, fellow Michigander! Joshua Chamberlain was evacuated from the battlefield in shock, having sustained a “near-mortal” wound to the pelvis. He suffered the convulsions and chills of septic shock for two months at the U.S. General Hospital in Annapolis, and did not return to duty for five months. By his absence from the field subsequent to his engagement there, he lost his ability to maintain perspective and context. He did not revisit eastern front of Petersburg for 18 years, and did not write any specific recollections of the attack until 35 years and more after the event. He significantly referred to his clouded memory and confused recollections in his Reminiscences speech of 1903. The only basis for the theory of an attack on Rives’ Salient from “Fort Hell” is Chamberlain’s late recollections, recorded in his memoirs and reminiscences from the last two decades of his life, and the frequent repetition of those recollections over the past century by his faithful biographers. The “Fort Hell” scenario is contradicted by Chamberlain’s own statements that, as his attack was launched from a point “not less than 300 yards” from the Rebel entrenchments, his right flank was situated on a deep railroad cut; that there was a marsh or bog in the ravine on his front (40-50 yards wide, according to DeLacy), which forced him to give the fateful order “Incline to the left,” as he was shot; that he could see Twitchell’s IX Corps battery (which was north of the Taylor ruins, north of Baxter Road) bastioning the slopes above as he lapsed into unconsciousness (“where darkness fell upon my eyes, and I thought to see no more”); and that Mink’s battery was firing from north of the Taylor house into an ice house on his right front. It is contradicted by Gen. Griffin’s orders for Chamberlain to protect the batteries of Phillips, Stewart and Richardson that were assigned to the 1st Division, and were positioned at the Baxter Road, and also by the order for Chamberlain to silence an advanced Confederate artillery outpost just across the Deep Cut of the railroad. It is contradicted by Col. Tilton’s Official Report, and the letter of BG O. B. Knowles, both of which connect the right of Chamberlain’s brigade with the left of Sweitzer, who was north of the Baxter Road. It is contradicted by the reports of Gen. Warren and Lt. Col Lyman, who went up on the open plain northwest of the Avery farm to watch the Chamberlain’s mid-afternoon attack at the center of the Union line. It is contradicted by the reports of Bigelow, Hoffman, and Tilton that place Chamberlain on Hoffman’s right, and by Henry Gawthrop’s map and Samuel Bates’ report, both of which have Hoffman’s right near the Baxter Road. It is contradicted by multiple reports describing the subsequent movement of Griffin’s Division, including the 1st Brigade, a mile to the left to the Jerusalem Plank Road on June 21. It is contradicted by seven regimental histories from the 1st Division, V Corps, three from Chamberlain’s 1st Brigade and four from Sweitzer’s 2nd Brigade, which mention that those units either charged and occupied the position from which Burnside’s famous mine was dug and exploded, or that they were relieved by IX Corps troops. Chamberlain’s claim is also contradicted by the report of Gen. Bushrod Johnson and the Diary of the First Corps, both of which describe an attack that could be none other than Chamberlain’s, occurring in mid-afternoon against Elliott’s brigade just south of the Baxter Road. Chamberlain’s claim to have engaged Generals Kershaw and Field is countered by their silence. Those of us who believe that Chamberlain’s attack was not against Rives’ Salient have no intention of impugning the courage, heroism, intelligence, honesty or integrity of the Lion of the Union. We simply believe that he was mistaken about a single fact—his position on the battlefield. His confusion is with good justification, considering what he endured. The simple fact is that, just as the testimony of a single observer is not sufficient to establish the truth of a matter in a court of law or in a scientific research laboratory, so it should not be definitive in a question of a historical nature. The documents of history tell a consistent tale that is at odds with the theory of a charge at “Fort Hell.” It is time to look again at this matter in a new light. I was trying to enjoy a vacation but the park ranger today at Wilson’s Creek asked me if I had heard about the Chamberlain “who ra ra” so I guess there is no escaping it. This site was meant to be an auto tour and is still not done, but I guess I might as well show it at this point. Thanks, Susan. I appreciate the trouble you went to in providing this. There is a lot of information on Susan Natale’s website, and I appreciate the enormous effort that she has expended in collecting the primary source material, and in making available to others. Unfortunately, her personal comments simply restate the entrenched position, and do nothing to advance the discussion by answering the detailed challenges addressed in my post of November 17. Susan’s map shows Sweitzer’s brigade advancing well to the south of the Baxter Road, whereas Col.Tilton’s Official Report has all of Sweietzer’s regiments except one advancing to the right, or north, of the road. How do you just ignore that discrepancy? without knowing or caring where the Crater was? It is the most famous and most easily-recognized landmark on the battlefield. When BG Oliver Knowles of the 21st Pennsylvania, Sweitzer’s brigade, says “Immediately in front of my Regt. was the redoubt which our forces afterwards so unsuccessfully attempted to blow up (“Burnside’s mine”),” and then connects the left of his brigade with the right of Chamberlain’s, you just simply have to bother to find out where that mine was, if you want to be informed about Chamberlain’s position on the battlefield. A serious historian cannot afford to ignore such crucial details, and these are just the tip of the iceberg. Dennis, Both you and Susan want to accurately place where Chamberlain was wounded. That’s one of many things in common. I don’t think Susan is ignoring any details, but rather is placing more importance on other details. That’s why we get different interpretations. As to the reports in the OR, we have to keep in mind that they are not necessarily right either. They, like all other sources, need to be looked at critically. Remember the warning given to us by James H. Kidd in his memoirs of the war [review here], saying many times commanders writing their reports draw on their imaginations for the facts. I don’t have a dog in the hunt, so to speak, but it seems to me that the critical piece of evidence is that the troops who occupied the area around Rives Salient appear to have not been attacked—or at least not noticed one. As a disinterested observer, I need to hear an explanation for that. To me, that assumption is very problematic. If it is true that “many times commanders writing their reports draw on their imaginations for the facts,” then what is the sense of being a Student of the American Civil War? Why not write your own story, instead of relying on the fantasy life of others? Certainly there are mistakes involving dates and times, like the one placing the subsequent explosion at the Crater on July 31 instead of July 30. However, making such an error does not necessarily invalidate the substance of the report, which is that the 56th Pennsylvania charged a quarter of a mile south of the site afterwards selected for that mine. The focus is on geographical location, not time. Skepticism engendered by the minor irrelevant mistake might prompt you to want to compare Bates’ claim in the History of Pennsylvania Volunteers with Henry Gawthrop’s elegant map of the position of Cutler’s brigade on June 18. This would reveal that they are in absolute agreement with respect to the location of Cutler’s right flank. Then you might find Colonel Tilton’s and Major Knowles’ reports saying that Sweitzer’s brigade was mostly north of the Baxter Road and that Hoffman connected with Sweitzer’s left, providing further support for the statement in Bates. Then you might consider the accounts of Lyman and Warren, which place Chamberlain’s mid-afternoon attack at the center of the V Corps line, not on its left flank. Through this process of validation by comparison, any initial mistrust regarding the real substance of the Bates account would be erased, establishing the point much more solidly than if you had not doubted it and bothered to check it out in the first place. Susan has said that the Crater is not a reliable landmark because it was not there on June 18. While it is true that the explosion did not occur until July 30, Pegram’s Salient, the battery that was blown up, was in place on June 18, and it did not move. The whole Union Army would come to know where the Crater was situated, with respect to the Baxter Road, the Taylor farm, and the tunnel entrance to Burnside’s mine. Seven regiments from Chamberlain’s and Sweitzer’s brigades claimed to have charged and occupied the ground from which Burnside’s mine was dug. Confederate commander Bushrod Johnson described the 6 p.m. attack against Pegram’s Salient (the site of the Crater) that was mounted by Sweitzer’s brigade and observed by Lyman, Warren and Griffin from the V Corps HQ near the Avery house. If all of the accounts dealing with Griffin’s division attacking Pegram’s Salient were drawn from the imaginations of the commanders, there must have been a lot of hallucinatory substances in the chow on both sides of the battle line on June 18! I think we have reached an impasse. The discussion has been interesting, but it once again proves that it is almost impossible to persuade people to give up firmly held convictions, through the presentation of contrary evidence. My position will be laid out more completely in Joshua Lawrence Chamberlain at Petersburg, tentatively scheduled for release by Savas Beatie in May, 2016. Thanks for your interest. Dennis, that’s part of the craft of the historian–sifting through the evidence, looking for corroboration, critically evaluating evidence. One report is not necessarily what happened. It is what one officer is claiming happened. Historians aren’t doing their jobs if they take every source at face value without trying to evaluate them. Thanks for participating in a collegial, respectful, and thoughtful discussion focusing on the issues at stake, not personalities. I hope to be able to go over all the evidence this week if able, and that will probably result in at least one more post on the subject. Keep in mind Crawford’s men and men from the 9th Corps also say they were at the future site of the Crater. From your map And comments I assume you have decided that those accounts are unreliable. So you can’t be too hard on me for finding other accounts metioning the Crater unreliable. I imagine that a soldier is more likly to be accurate in describing a forrest or stream than the Crater, they personally saw the forrest or stream, the Crater they heard about later. In the assault that was made, the brigade advanced nearly a mile, forcing back the rebels, and gaining position on the Norfolk Railroad, within a mile and a half of the city. Withdrew from railroad cut, and formed in line of battle in the county road, along the base of the slope overlooking and near the railroad. Here the men worked diligently all night, throwing up intrenchments. The 13th Massachusetts, unlike some of the other 3rd Division regiments, did not stop at the railroad cut. They sent advanced skirmishers off to their right flank where, protected by woods and ravine, they were able to ascend a gully on a hill extending from the creek bank to the upper line of Rebel earth works. Beginning on June 18, they deepened and extended the gully, so as to form a sunken way that could be safely traversed. The men of the 13th Massachusetts named their hill “Fort Crater.” They were expecting to make a charge on the works to the front at 7:30 p.m., but the plan was abandoned. Crawford to Griffin, June 21: After receiving your reply to my note I saw General Warren, who disclaims that any order to pass your troops through my lines was given to you on the 18th instant. Griffin to Crawford, June 22: Respectfully referred to Major-General Warren, commanding V Corps, and if consistent with the interest of the service I should like to have this question of orders investigated at once, as I think I can establish the correctness of my statement. Warren, June 23: I did not intend General Griffin to march his troops over General Crawford’s. I thought General Griffin was to form on General Crawford’s left. My orders, however, were so imperative to move forward that General Griffin may have had to do this without waiting to make different arrangements. The pressure under which I acted compelled me to urge rapidity of movement, but I did not suppose this thing would have happened. It was a very trying day to me, and I am willing to assume the whole or any fault rather than any feeling should exist between the two divisions. With so great difficulties as we have to contend with, annoying occurrences of this kind must be met with mutual forbearance. From this exchange, it would appear that, as Crawford was withdrawing at least a part of his division from the vicinity of the railroad cut, under orders from his Corps Commander, Griffin was advancing his troops, passing through Crawford’s lines, apparently stepping on some toes in the process. Part of Crawford’s division may have gone into reserve while Griffin continued the attack. This would explain how two of Sweitzer’s regiments, the 91st Pennsylvania and the 22nd Massachusetts, could be relieved by units of Crawford’s division during the early morning hours of June 19. Those 3rd division units were relatively rested, having not been involved in the major fighting on June 18. Thanks, Dennis. I appreciate the effort you went to on this. The 16th Maine was with the First Brigade that was held in reserve. Where was a mine exploded on July 31? I apologize that I only know of one on the 30th. I think, Susan, this was a case of a little sarcasm on your site leading to a bit of confusion. The source obviously used the wrong date for the mine explosion and in calling attention to that inaccuracy you used some snark, which led to Dennis’ misunderstanding what you were doing. Yup, my sarcasm was meant to suggest that if there are inacurracies with that account we cannot trust it over others. And, as I have said the crater is not a reliable landmark as it wasn’t there on the 18th. Pegram’s Virginia Battery sat on the top of a hill, only a few hundred feet from the V Corps pickets on June 18th. Thousands of soldiers saw it at the time. Later the IX Corps took over the V Corps sector and additional thousands of men also saw it. In other words it was a landmark on the battlefield. After the battle of the Crater men learned that Pegram’s battery had been blown up and recalled that they had been posted in front of that battery. That is why so many men mention that they were at the future site of the Crater battle. It is a perfectly valid landmark to figure out where soldiers were posted in June and July 1864, certainly more valid as the church steeples Chamberlain said he recognized 40- years later. I should add that the battery was protected by a large earthwork, which certainly drew the attention of the Yankees and also that the battery occupied a salient, i.e. a piece of land that jutted out from the main Confederate line. Well, if you take everyone from the 9th Corps, Crawford’s second and third brigades, Sweitzer’s men and Chamberlain’s men who say they were at the Crater at their word, that’s a lot if people at the future site of the Crater. Just an FYI concerning this fine and civil discussion. I made appropriate modifications to the section of my Petersburg website (www.petersburgsiege.org/assaults) that touches upon Chamberlain’s attack, with a link back to this blog entry. Was just looking at the Johnson report mentioned. The mention of one brigade south of the Baxter road at 6 gives me more confidence in the notion that Sweitzer stayed South of the Baxter road, considering all the evidence that he charged with Crawford at 6pm I am going to assume he was that one brigade. There is no need to assume anything. Col. Tilton’s Official Report has all of Sweitzer’s regiments except one advancing across the railroad and into a ravine to the north of the Baxter Road at mid-day. Theodore Lyman, after describing the 3-4 p.m. attack of Chamberlain and Hoffman on the left (of the Baxter Road–Warren said this attack was in the center of his line), then described a 6 p.m. assault on the right by Sweitzer and Crawford. So, part of Crawford’s division was engaged, but only a small part, and that north of the Taylor place. W. G. Carter, in Four Brothers in Blue, described a 6 p.m. charge by the 155th PA, 32nd MA, and 21st PA. The main event at 6 p.m. on Bushrod Johnson’s calendar was repelling an attack against Pegram’s Salient (obviously mounted by these Brothers in Blue from Sweitzer’s brigade). The 32nd MA, 91st PA, 22nd MA, and 21st PA histories all described evening attacks at the point where the mine was later exploded–Pegram’s Salient, north of the Baxter Road. Thomas Chamberlain’s History of the 150th PA (part of Joshua Chamberlain’s 1st brigade) describes a move to the right at 6 p.m. and participation in an attack on a fort in the front of the 150th PA that was blown up some time afterwards. In the past Historians of the Petersburg assaults of June 18, 1864 have faced a seemingly unanswerable problem. If Willcox’s division of the IX Corps and Crawford’s division of the V Corps were at the Taylor house on June 18th there wouldn’t have been room for Sweitzer to deploy north of the Baxter road. Luckily Julia Steele (battlefield archeologist at Petersburg) and others have provided the answer. First, Willcox shifted northward and second Griffin’s Division relieved part of Crawford’s division which went to the rear and formed a reserve. This left enough room on the front line for Switzer to deploy north of the Baxter road. HEADQUARTERS THIRD DIVISION, FIFTH CORPS, June 21 1864. Brigadier-General GRIFFIN, U. S.. Volunteers: GENERAL: After receiving your reply to my note I saw General Warren, who disclaims that any order to pass your troops through my lines was given to you on the 18th instant. Very respectfully, your obedient servant, S. W. CRAWFORD, Brigadier- General. JUNE 23, 1864. I did not intend General Griffin to march his troops over General Craw- fords. I thought General Griffin was to form on General Crawford’s left. My orders, however, were so imperative to move forward that General Griffin may have had to do this without waiting to make different arrangements. The pressure under which I acted compelled m~u to urge rapidity of movement, but I did not suppose this thing would have happened. It was a very trying day to me, and I am willing to assume the whole or any fault rather than any feeling should exist between the two divisions. With so great difficulties as we have to contend with, annoying occurrences of this kind must be met with mutual forbearance. G. K. WARREN, Major- General of volunteers. These communications can be found in OR Vol. 40, Part 2, page 280. I really don’t understand this argument that suggests if one brigade of Crawford was in reserve that that means the other two were not there as well. For that matter you could say Griffin was not there because Bartlett was in reserve. Here again, is where Crawford was. Now to the question as whether this brigade Johnson mentions could be Chamberlain’s. Lyman does not mention Chamberlain being involved at 6. Tilton who took command after Chamberlain does not mention it. Almost all the accounts by Chamberlain’s men do not mention it. The small portion of the 150th that possibly got separated from Chamberlain’s brigade and joined in a charge with Sweitzer can hardly be mistook for a whole brigade by Johnson. And besides, that person’s account says he was at the Crater, and you say there is no mistaking where the Crater was, so according to you we cannot place him South of the Baxter road. If you tell me that you can say you were at the Crater and be South of Baxter road, that will change things a bit for your argument. If you imagine that it was Chamberlain charging with Crawford at 6pm and that is who Johnson is describing, then you are suggesting (I presume from your map) that Sweitzer was out in front of them by himself at the stream from 12 noon on, and that Chamberlain and Crawford could not manage to move up next to Sweitzer at noon nor at 3 but finally getting there at 6. This scenario is hard for me to swallow, especially since Tilton in his report mentions Sweitzer’s right resting on the Norfolk turnpike road aka Baxter road as he started, that would mean according to your placement that all Chamberlain had to do was walk behind Sweitzer in a path Sweitzer had already cleared. Publisher Savas Beatie is telling me that my book, Joshua Lawrence Chamberlain and the Petersburg Campaign, will be released in September of this year, which is now only a few weeks away. Richly illustrated with photos and over 30 maps, it provides nearly 250 pages of documentation for the position that we staked out for the Virginia Department of Historic Resources, and that was debated on your website last November and December. Since our last correspondence, the Chamberlain marker has been officially moved to its new location on U. S. 460/Winfield Road, which is the state highway position running closest to the actual site of Chamberlain’s wounding on the battlefield. The book has been endorsed by numerous respected Petersburg historians and authors, including A. Wilson Greene, Pamplin Historical Park, author of The Final Battles of the Petersburg Campaign; William Glenn Robertson, author of The First Battle for Petersburg: The Attack and Defense of the Cockade City, June 9, 1864; Sean Michael Chick, author of The Battle of Petersburg, June 15-18, 1864; Brett Schulte, The Siege of Petersburg Online; Bryce A. Suderow, author (with Edwin C. Bearss) of The Petersburg Campaign: The Eastern Front Battles, June-August 1864, Vol. 1, and The Petersburg Campaign: The Western Front Battles, September 1864-April 1865, Vol. 2; and Julia Steele, Chief of Resources and Historical Archaeologist, Petersburg National Battlefield. It has been described as “deeply researched,” “methodical, comprehensive, and ultimately convincing,” and “an outstanding example of scholarship,” with “an admirable attention to detail” that has “established definitively” the site of Chamberlain’s wounding. I would urge you and your followers, many of whom seem not to have been convinced by our earlier debate, to watch for and read the book. I am confident you will find it very persuasive, if you read it with an open mind. Thanks, Dennis. I’m looking forward to reading it. Joshua Lawrence Chamberlain and the Petersburg Campaign (Savas Beatie, 2016) has been out for two months. My presentation on the site of Chamberlain’s attack and wounding was well-received at the Pamplin Park 20th Annual Civil War Symposium in October, and it has been endorsed by numerous respected historians of the Petersburg Campaign. However, the new understanding is still being challenged and dismissed by certain Chamberlain biographers, based primarily on the fact that my experience in historical research doesn’t match up to theirs. (http://www.timesrecord.com/news/2016-11-11/Front_Page/Did_Joshua_Chamberlain_forget.html). Since this topic generated some serious interest and discussion on your website last year, I am wondering if you have had a chance to read the book and to come to an informed opinion yourself? I have not had a chance to read it yet, Dennis. At some point I will, though.